The AutoBookmark™ software provides functionality for automatic generation of hyperlinked table of contents for PDF documents. The hierarchical table of contents (TOC) is created from existing PDF bookmarks by inserting new pages into corresponding PDF document or saving it as a separate PDF document. The software provides fine control over visual appearance of the table of contents entries and flexible page numbering options. The functionality provides a convenient way of creating new or updating existing table of contents for PDF documents. The software can automatically find and delete any previously generated TOC and re-build table of content pages again from the current set of bookmarks. Generating TOC for a single PDF document and inserting it into document itself. Generating TOC for a single PDF document and saving it as a separate PDF document. Generating Master TOC for multiple PDF documents and saving it as a separate PDF document. Visual Page Index provides an alternative way to add a visual table of contents to PDF documents. Use it to generate page index with hyperlinked thumbnail images of PDF pages. The software can generate both internal and external table of contents. Internal TOC is inserted into a specified location within the document itself (typically somewhere at the beginning of the document). 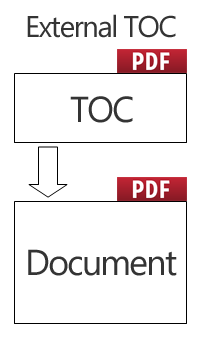 External TOC is saved as a separate PDF document and each TOC entry is linked back to the main document(s). The software provides selection of separate text styles to use for generating various parts of table of contents. Choose separate font, text size and color for the TOC title and 4 levels of the headings. Both line spacing and level offset can be customized. Optionally, text color for each entry can be inherited from the corresponding bookmark. Each TOC entry has the same hyperlink (PDF "action") as a corresponding bookmark. The hyperlink can be of any kind and point inside or outside of the current PDF document. The page numbers are displayed only for TOC entries created from bookmarks that point to a page in the current PDF document. TOC entries that do not point to a page will have no corresponding page number displayed. The software can either automatically select page size and orientation for TOC pages (based on the dimensions of the first page in the current PDF document) or use a user-specified page size. Page margins can be individually customized as well. 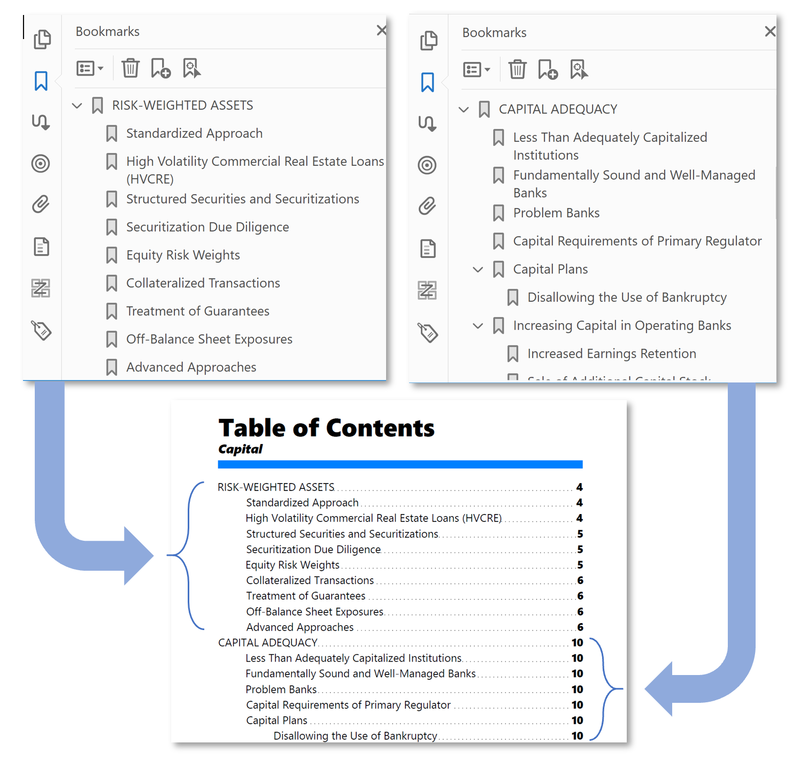 Select a range of bookmark levels for building a table of contents. Bookmarks without actions can be optionally skipped. This feature provides a way to exclude certain bookmark levels from TOC. The AutoBookmark™ software provides 4 different option for TOC page numbers. The software can use custom page labels as displayed in the "Page Thumbnails" navigation panel and in the "current page number" box in Adobe Acrobat. Page labels can contain any kind of text, not only decimal numbers. Page labels are great way to use different page numbering schemes within one document. Sequential page numbers (starting from 1) for PDF pages before the table of contents is inserted into the PDF document. Optionally, a user-specified page offset can be applied. Bates numbers are special kind of identification numbers that can be added to PDF pages by "Add Bates Numbering" function in Adobe® Acrobat® . If there are no Bates numbers assigned to the pages, then the corresponding page number will be blank. There are 5 different methods how TOC pages can be labeled. Page labels are shown in the "Page Thumbnails" navigation panel and in the "current page number" box in Adobe Acrobat. Page labels can contain any kind of text, not only decimal numbers. 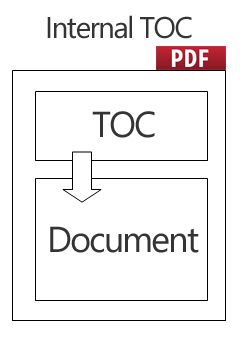 TOC pages use a separate from the rest of the document page labeling scheme, because TOC pages are automatically generated and potentially can be updated later. Optionally, a text prefix can be added before the auto-incrementing numbers. For example, TOC-1, TOC-2 and etc. This option takes a user-selected PDF file and inserts all of its pages in front of the table of contents. Add custom background of any complexity to every TOC page. Design a page in the separate PDF file to serve as a background and use it to customize visual appearance and behavior of the TOC pages. The first page from the “background” PDF will be placed behind the content of every generated TOC page. Use this functionality to add borders, navigational buttons or links, custom headers or footers. Here is an example of the TOC with background PDF added. It adds some graphics and navigational toolbar. The software can automatically find existing TOC pages (generated by AutoBookmark) in the current PDF document and remove/replace them. This feature is convenient for rebuilding table of contents. This operation is also available as command in Action Wizard for batch processing. The video explains how to create table of contents from PDF bookmarks using AutoBookmark software.